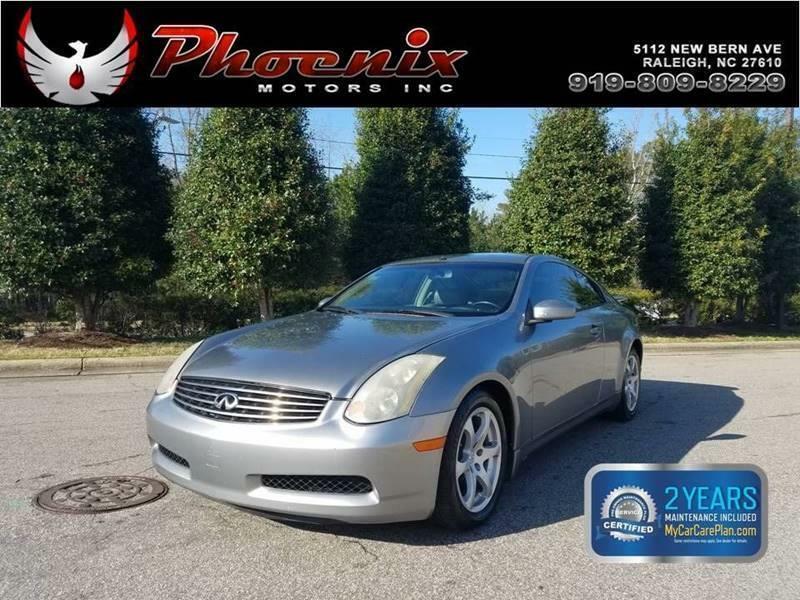 I would like to learn more about this 2005 Infiniti G35 Base Rwd 2dr Coupe. Please contact me as soon as possible! The Infiniti G35 sedan is among the sportiest of the so-called near-luxury cars. Its a true sports sedan, with a powerful V6 engine, rear-wheel drive and a sports suspension. All G35s are powered by a 3.5-liter V6 engine, the same engine used in the Nissan 350Z. In both the coupe and sedan, its rated at 280 horsepower with the automatic or 298 horsepower with the manual. Leather upholstery is standard equipment for 2005. Also standard: automatic climate control, power-adjustable heated front seats, heated power mirrors, a 120-watt AM/FM/CD stereo with RDS, steering wheel audio controls, illuminated visor vanity mirrors and high-intensity discharge (HID) xenon headlamps. Safety features include dual-stage front air bags, curtain airbags designed to provide head protection for front and rear outboard passengers, and front-seat side-impact airbags designed to provide thorax protection. Also standard: active head restraints, seat belts with pre-tensioners and load limiters, LATCH (Lower Anchors and Tethers for CHildren). A tire-pressure monitoring system is standard. Active safety features include an electronic stability program (VDC) to help keep you from skidding off the road, antilock brakes (ABS) for maintaining steering control in an emergency stopping situation, electronic brake-force distribution (EBD) for shorter stopping distances and more stable braking, and Brake Assist to maintain full braking force in an emergency stopping situation even if you accidentally relax brake pedal pressure.